Norwood, Mass., June 6, 2017 - The Electronic Design Innovation Conference and Exhibition (EDI CON) USA, the first industry event to bring together RF/microwave and high-speed digital design engineers and system integrators, announced today the addition of the European Radar Summit to its conference program at the Hynes Convention Center, September 11-13 in Boston, Mass. 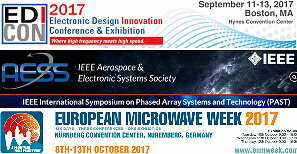 Organizers of Radar technology sessions at the IEEE Phased Array Conference and the European Microwave Week Defense Forum have selected a number of papers to present at the EDI CON USA European Radar Summit on Tuesday, September 12. Led by Alfonso Farina, Selex ES-Italy retired, the session's papers will cover topics such as conformal and phased array antennas, multi-static passive/active array radar, wide band signal processing and overall radar trends. "Enhanced target detection and localization by cueing in multistatic passive-active radar systems," T. Brenner, L. Lamentowski, R. Mularzuk, PIT-RADWAR SA (Warsaw, Poland). EDI CON USA 2017 is supported by its primary media sponsors, Microwave Journal and Signal Integrity Journal. For future planning, EDI CON USA 2018 will be held at the Santa Clara Convention Center (Santa Clara, CA) October 17-19, 2018.